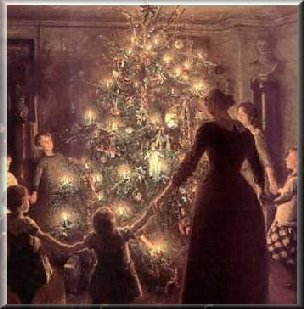 From childhood, the Christmas tree was a source of unceasing delight. Gazing at the sparkling ornaments twinkling in the multicolored lights, even after my dad's consternation in sorting through the tangled strands, was so peaceful. A child has no idea what work that is! A hard earned hint from my own experience: if you have children, guywire the tree. Take fine metal wire, attach securely to molding or curtain rods on either side after wrapping it around the treetop once or twice. It isn't very noticeable, and sure is better than seeing the tree crash. Yes, this happened to our family one year. For those of you that want the perfectly decorated tree, I made a Christmas tree decorating page. I am not a tree decorating maven, but I hope the ideas inspire you! always use multicolors and little lights, and my grandmother's hand crocheted snowflakes. I guess I'm just a multicultural girl! Oh ha, ha, ha (someone has to laugh at my terrible jokes). We have had many different approaches to obtaining a tree. For a while we traveled to a "cut your own" tree farm; this was a lot of fun, especially when we went with friends. The weather should be clear and remember when it's cold and snowy that little fingers and toes get cold quickly. So, those who search for the perfect tree and the man who isn't sure with the axe might prefer the normal pre-cut tree. B efore you get bored and go away I'd like to share a lovely and enduring tradition our family has: the advent log. Years ago, I came across this idea, and like our family it has been modified through the years. The original log was a young mulberry tree, about three inches in diameter, I think it was originally about seven feet long; it was fairly straight with a little shaving across the bottom (here and there) to make it even. Candle holes were drilled across the top, one for each day between Thanksgiving and Christmas Day. Though we have tried different colors, I like ivory candles the best. Each evening we would have a small devotional reading and light one additional candle. The lighting started at either end, the far right, then far left, adding one more lit candle each night until the culmination of all the candles burning on Christmas Day. It is beautiful with graduated heights making a pyramid shape. Some nights we included little crafts, at the beginning, later we simplified to just scripture reading and singing carols together, ending with a short prayer. This tradition of ours has changed through the years: sometimes we double up candles, and we did cut the log smaller a few years ago, since we no longer have a big mantle to set the log on. One night, I played a little Christmas scene while putting up the nativity set (this goes over big with the younger set). I'm very mindful of fire hazard, so we always line the mantle or table or piano with aluminum foil, and decorate the log with foil garland strands or a bed of spun glass. Our children, when young respected the "no touching" rules about fire and ornaments. The candles are extinguished as we sing "Silent Night" together. I would never leave candles burning- it ruins the pyramid effect if you do, anyway. Advent wreaths are the same idea, but with the very manageable time schedule of one candle per week from three weeks before Christmas. It serves to center your thoughts and those of your family on the central meaning of the season. Advent blog, or more about the traditions? While on the subject of candles, I must say it is one of the highlights of the season to light candles throughout the house. Try always to use a base impervious to fire: metal or ceramic (and I think you are tempting fate when using real evergreens underneath- have you ever seen dry branches flame up in the fireplace? Quick combustion guaranteed). Don't you think pictures of Scandinavian Christmases are inspiring? I love their generous use of candles, numerous with simple design. It was an effect I mimicked one year by buying many simple (and cheap) water goblets in a tulip shape. Filled with water, a slick of vegetable oil, and little floating wicks, the lights all in a row are so cheering on a dark winter night. We had a cut glass transom with a deep sill, and I had almost fifteen glasses across. (One of my favorite visual memories). These can be surrounded by cut flowers or evergreens, and used on a table, as well. Another idea, especially for those in small apartments is to cut out small paper snowflakes and hang them on a Norfolk pine houseplant. They look pretty on a weeping fig tree,too. Just fold up paper (typing paper will do) and use manicure or small sewing scissors to cut lacy shapes; it isn't necessary to be an expert: they look pretty hung from small ornament hooks. I did this when I was first married- my house wasn't always clean, but I had beautiful, lush houseplants and the Norfolk pine was about 2-3 feet tall. Now, of course, the craft stores are full of miniature Christmas ornaments and very nice artificial feather trees. (Whatever you call those tiny trees!) I have a few of those,too! They are useful for bedroom spaces, dining room tables or piano tops. Anywhere the living trees or resinous branches might be too messy. Want more home decor ideas? My page of Homey Touches has even more cheery holiday ideas.